Dr. Nadrea Sookhoo is originally from Toronto, Canada. After completing her honors bachelor’s degree at the University of Toronto she started veterinary school at the University of the West Indies graduating with honors in 2006. She received a scholarship in 2006 to attend a course in wildlife rehabilitation and utilization in South Africa affiliated with The University of Pretoria. After graduation Dr. Sookhoo worked for 2 years as a general practitioner in New York and Florida. She then moved to California to complete a small animal medicine/surgery and emergency internship at Animal Emergency Specialty Center in Torrance. Dr. Sookhoo has a passion for ophthalmology and has spent over 3 years in this specialty field completing internships and courses. She completed an ophthalmology externship and internship in Canada and another ophthalmology/emergency medicine internship at Blue Pearl Veterinary Partners in Michigan. Dr. Sookhoo is a member of the American Veterinary Medical Association. She is a co-author for a review article published in Compendium Veterinary Journal about Sago Palm Toxicity in Dogs. She is an avid learner and is continually completing continuing education courses online and at conferences. With over 10 years in practice and working in many different states, Dr. Sookhoo and her husband, along with their new baby girl, have decided to make Florida their home. 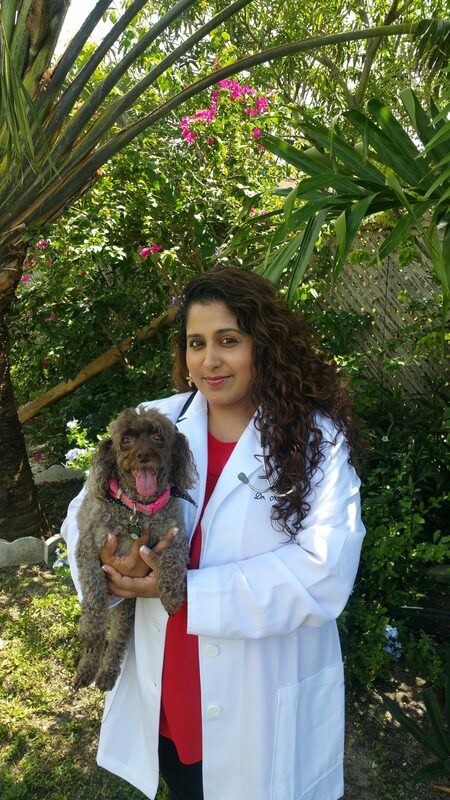 Dr. Sookhoo joined Calusa Veterinary Center in June 2018. She is very excited about starting at such a progressive practice as Calusa Veterinary Center and is dedicated at providing the best medical care and compassion to her sunshine state patients! Dr. Sookhoo’s four-legged family at home consists of two toy poodles, “Bella” and “Jasmine”, “Bun Bun’’ the bunny, “Baby” the Tortoise, and “Godzilla”and “Lizardo” the Leopard Geckos. Her 2-legged family consists of her Michigan native husband and their daughter. In her spare time Dr. Sookhoo loves to dance and enjoys singing. She plays the piano and recently has been learning to scuba dive to enjoy the waters off the Florida coast.